Don't miss Brummie-Contra on 21st May 2017 with Seth ! - Get a taste yourself for his slick approach and "nutty flavour". 2017 - Brummie-Contras More Date Details SOON ! 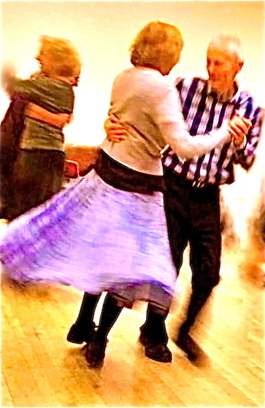 - Most Dances are Sunday afternoons at Elmdon Heath Community Centre Hall. FOR AN AMERICAN-CALLER DANCE : AT THE DOOR: ADULT £11 : STUDENT £7. [or - Get this pay-early discount during September] - HERE. Primary venue, B91 2SF - Elmdon Heath Community Centre Hal﻿﻿l. : Sun 22nd January : ​ Rhodri Davies calling - with an excellent new contra duo Alan Brunier ​& Benjamin Rowe. M42 J5i s nearby. New, as well as regular dancers should find this an accessible venue. What Hall looks like HERE. Position: Satellite gMap HERE. Named: open map HERE. Opened for shelter earlier, for travellers a welcoming hot drink & biscuits at 1:30pm. Sunday Brum Buzzes first : then Rail Stations (each also on a dedicated page). 2016 saw the most helpful S1 bus entirely removed. Stop at Solihull Station to catch 966 directly was taken out too. By each bus route or suggested time: is now a CHECK link : do just that. If link fails, timetable may be changed. NEAREST rail to CC Hall is - SOLIHULL. More HERE : our page on Solihull Station. Hall is 7-11mins cycle: 20-26 min walk from Solihull Rail. Two sides of A4 maps & routes: see & print off from ROUTEMAPS page. Walkway, bus & cycling details are also available on these. FREQUENT (less than 10 min) buses from Solihull Station run along Lode Lane. Leave a 5 to 8 min walk to Hall. Times/route on carry-map, & at Rail - Solihull Station. 966 - direct, hourly Sun bus service - NOT outside Solihull Station: it's 3min walk away. Catch 13:17 from Solihulll Stop SB. 7 min ride, & alight at Greville Arms, opposite the hall. BUT - Next 966 bus is at - 14:17. Best RETURN back to Solihull Stn : IS the hourly 966. Leave dance PROMPTLY at END. ﻿- ride to Solihull Centre : 3 min walk to Solihull Station. NB. This return bus is NEXT timetabled at 18:31. LIFT FOR 4 PEOPLE to Elmdon Heath - FROM UNIVERSITY STATION. Meet 12:30 ! - to same bus stop ​opp Lode Heath School, 5 min walk to venue ! Right along Moat Rd. It becomes Cornyx La - Hall is on Right. See walk from bus stop to hall marked HERE. ​A satisfactory venue - 2017's Brummie Contras ( not Good Friday ) will continue here ! - With nearby motorway access, hopefully regular & new dancers will find it accessible. What the hall looks like HERE. Its position on Satellite gMap HERE. Sunday buses first : details below. Save £3.50 per dance with a Brummie Contras SEASON TICKET ! Buy in 2016 for best saving ! Covers 10 Dances. Contras on 7 Sunday afternoons: 2 Friday Contras & the Sunday Christmas Party afternoon. 2016 - Remaining Brummie-Contras 1 + + Dates ! - All Dances presently are at Elmdon Heath Community Centre Hall. A Special Bonus, fun party-dance ! A fun Brummie C's "Sunday Variety Party" with Contras & squares. so you may bring along friends or relatives for fun squares and mixers as well as introducing all to some of our lively American Contras. The prepayment Deadline has passed for this Sunday. After then, complete & email a prepay dance form for 6th Nov.
for his first visit to Brummie Contras﻿﻿ ! Download, complete to email a prepay dance form. Deadline has passed for this Sun. ﻿Join us on Sunday 23rd. for Jake's lively and precise calling. DD are invited again. They are so excellent a dance-driving duo ! Join us on Oct 2nd for yet another ! + The Christmas Party - Sunday Afternoon 18 Dec.
+ an EXTRA Contra on the last FRIDAY Afternoon of 2016 - 30th Dec.
Come - join us. 2017 Dances will have yet more superb band lineups. 2017 - Two more hot blooded real Americans are to be calling for us in 2017 ! - both are again kindly to be arranged by Meg. STILL 7+ BRUMMIE CONTRA 2016 DATES. Save £2 if you PREPAY before deadline. Covers the whole weekend from Friday afternoon to Monday afternoon. - Note: Venue presently continues to be Elmdon Heath ! Join us : Oct 2nd : another superb caller ! Geoff Cubitt was on 26 June to brilliant exuberance of Warwick Uni Folk Soc Contra Dance Band. Our band for Nov 6th Contra-Alt-Delete﻿﻿ ! Our band for Oct 2nd - ﻿﻿﻿﻿The Night Before﻿﻿﻿﻿ ! + EXTRA Contra on the last FRIDAY Afternoon of 2017 - 30th Dec.
Come - join us. 2017 Dances have yet more superb band lineups. Contras with real "lift". Two more hot blooded real Americans are to be calling for us in 2017. ! - Seth Tepfer on 14 May 2017. ! Many delighted in Contras called by Seth at Lichfield F.F. in June 2016. - both are kindly again arranged by Meg. if you are neither at the Summer dances of 2016 yourself, nor bringing along your friends. Two hot blooded real American ladiess are calling for us. if you are neither at the Summer 2016 dances yourself, nor bringing along your friends. Dances continue to more superb band lineups. Contras with real "lift". - one sequence of the dance takes you past two couples. You spend little or no time waiting at the end. (You often find here, that you automatically change sides. Each dance of this type may cause odd things to happen to you near the end of the set. Double progression is popular with regular Contra dancers because the moves are slick, and keep you thinking as you dance. With as usual, lady on the right of man ! Sun 3rd Jan - Geoff Cubitt & “The Night Before” 2016 FULL year list & updating. MON 9th - Fri 13th May CIS WEEK @ HALSWAY I return THURSDAY EVE ! Fri 13th May Dr. RAMEN - MY HAND OPERATION ! [Fri 18th-Sun 20th Nov. Contra w/e. Rhod & Mark. ]- 3rd w/e Halsway Zesty w/e ! So, Sun 26th Nov - Is also a possible for Brummie C. : - BUT ANNOUNCE THE CHANGE. The skilful, yet playfully enthusiastic ﻿Cis Hinkle of Atlanta Georgia. Delights dancers in USA, UK & Denmark. From Solihull Rail Station: BUSES are frequent along Lode Lane. 72 or 957 Buses from Station. Best drop off opposite Grove Rd. Walk Grove Road. Becomes School Lane. Left into Broomfields Farm Road. At its end cross Shustoke Road into footway. Continue under A41. Follow footway.Cross Elms Close. Cross Redlands Rd. Emerge beside Hall in Cornyx Lane. Or - S1 BUS leaves Solihull Rail Station at quarter to & quarter past the hour. Drop off - end of Yew Tree Lane. Walk along Yew Tree La. As it becomes Cornyx Lane, CC Hall is on left. Just before DANCE END - 17:33. BUS 966 stops same side - outside Hall - to Solihull Centre : short walk to Station. Next bus at 18:31. Warwick Rd, Union Rd, Passageway to - School Ln, Broomfields Farm Rd, Passageway under A41 to HALL.